Judah died on a trip to New York, contracting yellow fever on his voyage through Panama. A transcontinental railroad, had it existed, would have spared his life. The prophet of the transcontinental railroad did not live to see it built. Yet his scouting, surveying, lobbying, and fundraising efforts defined the route and prepared the way for the technology that would unite a nation. Theodore Judah and the American railroad matured together. He was born in 1826 in Bridgeport, Connecticut. In 1830, America had just 23 miles of track, but the railroad business was about to explode. As a boy Judah studied civil engineering. By 18 he was a railroad surveyor, giving himself a practical education in technology not even two decades old. Engineers were in high demand in the late 1840s, as tracks spread across the countryside like creeping vines. 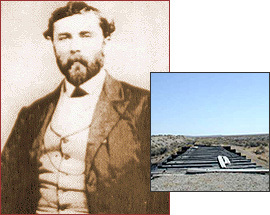 Judah's enthusiasm earned him the nickname "Crazy Judah," but by 1856 he and his men had built the Sacramento Valley Line, the first railroad west of the Missouri River. The following year he published a pamphlet, "A Practical Plan for Building the Pacific Railroad," reviewing engineering problems and painting visions of a nation united by tracks -- and commerce -- from coast to coast. Such a railroad had been discussed for decades -- but the financing and engineering obstacles were formidable. Nominated by California's 1859 Pacific Railroad Convention, Judah traveled to Washington for a crash course in lobbying. He returned having argued persuasively for transcontinental train travel. But he realized he would have to define a practical route and find private financial backing. By October 1861, he had both: a route over the Donner Pass in the Sierra Nevada, and a group of California businessmen as partners. Soon after President Abraham Lincoln signed the Pacific Railroad Act in 1862, tensions mounted between Judah and his business associates. He decided to find new partners in New York -- but he got sick during the journey, and died soon after his arrival on the east coast in late 1863. Judah's partners, known as the Big Four -- Collis Huntington, Charles Crocker, Mark Hopkins, and Leland Stanford -- would reap the rewards of the project Judah set in motion. When it was completed in 1869, the transcontinental railroad made the nation smaller, fostered trade, and improved frontier life.